Welcome to the Indiana Teacher of the Year Program! 2020 INTOY Application now available! Each year, the Indiana Department of Education conducts this special program to recognize outstanding classroom teachers from across the state. One person, in accordance with National Teacher of the Year guidelines, is chosen to represent Indiana teachers at the national level. The mission of the Indiana Teacher of the Year Program is to inspire, rejuvenate, and celebrate the teaching profession. The Indiana Teachers of the Year (INTOYs) are the voice of education throughout Indiana and the Nation. 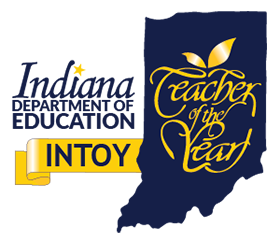 The INTOY award is a lifetime role in education, which has many opportunities to celebrate teaching and uplift the teaching profession. INTOYs are comprised of a network of exceptional teachers whom are now retired educators, administrators, college professors, and teacher leaders that continually provide support to the education community. The Indiana Teacher of the Year Screening & Selection Committees review all eligible applications. The Screening & Selection Committees will be made up of former INTOY recipients, IDOE staff, educational organization leaders, business and community leaders, as well as representatives from Higher Education. 2019 Indiana Teacher of the Year: Congratulations to Tamara Markey of the Metropolitan School District of Lawrence Township for becoming Indiana’s 2019 Teacher of the Year! INDIANAPOLIS – The Indiana Department of Education (IDOE) announced today Tamara Markey of the Metropolitan School District of Lawrence Township as the 2019 Teacher of the Year. Markey teaches pre-engineering at the McKenzie Center for Innovation and Technology. Markey is a graduate of Purdue University with her Bachelor of Science in Industrial Engineering and her Masters in Engineering Technology Education. Markey first began her teaching career at Lawrence Township’s Fall Creek Valley Middle School. Alongside teaching, she serves as a member of the District’s Science, Technology Engineering, and Mathematics Coalition Task Force, a faculty advisory for the Architecture, Construction, and Engineering Mentoring Program, and a member of the Graduation Pathways committee. In addition, Markey is a Woodrow Wilson Teaching Fellow, and a Project Lead the Way Instructor. Prior to teaching, Markey was an engineer with Amoco Oil and BP Pipelines. As the 2019 Teacher of the Year, Tamara Markey will represent Indiana in the National Teacher of the Year Competition. For over 60 years, IDOE has conducted the Teacher of the Year program to recognize outstanding classroom teachers from across the state. The program’s mission is to inspire, rejuvenate, and celebrate the teaching profession. Finalists are chosen from a pool of applicants and the screening and selection committee is made up of former recipients, IDOE staff, educational organization leaders, business and community leaders, and representatives from higher education. Former winners are comprised of retired educators, administrators, college professors, and teacher leaders that continually provide support to the education community.